Pours a deep, dark amber-brown with a fine, minimal off-white head. It is cloudy at first due to chill chill haze. The smell is initially of pine and floral hop notes, which are followed by some sweet malt. Right off the bat, this beer delivers a healthy dose of hop bitterness. The sweet malt up front almost instantly fades to the hop flavors, which are pretty mild for a Stone beer, but Oh-so pleasing to the palate. Great green and grassy pine flavors, and a hint of citrusy grapefruit that gives it a great bright, crisp taste. The beer has a medium mouthfeel and a good helping of carbonation, which make for a refreshing, yet bold and flavorful experience. The light hop elements and the refreshing quality contributed by the citrus flavor as well as the effervescence from carbonation create a crisp and sessionable beer. One sip demands another. 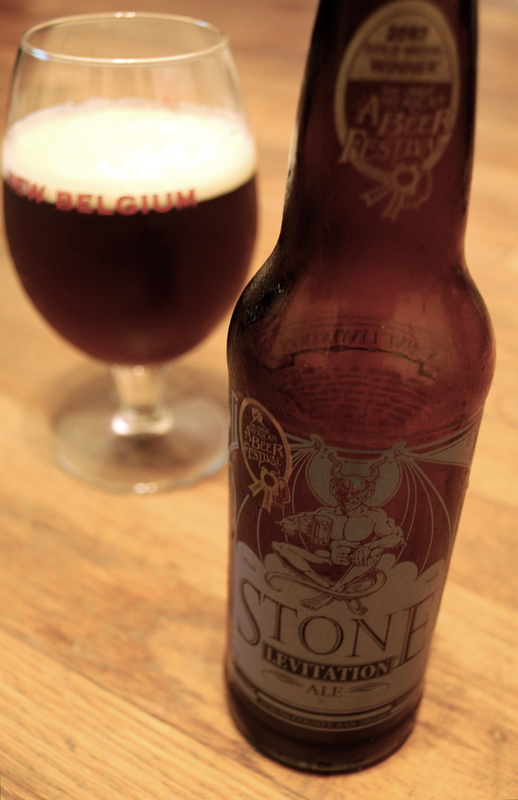 In my opinion, this beer would be great for a late fall afternoon or early springtime drink. The combinations of refreshment and bold flavors make for a nice transition time beer that goes great before the cold and the accompanying heavy stouts, but also great before the wheat beers and seasonals of summer.